Woohoo! Just bought my tickets for Saturday's full schedule at the Hero Complex Film Festival: "Robocop", "A Clockwork Orange" and "Super". GOD BLESS IT!!! OK, now it can sell out. HA-HA! I'm gearing up to buy tickets for the Hero Complex Film Festival, which go online at 10am. The event runs for four days, May 18 - 21, and I'm really looking forward to Saturday's schedule the most. All of this will be taking place at Regal Cinemas at LA Live in downtown Los Angeles. The last two years this thing sold out pretty fast so I have an alarm set on my phone to go off at 9:55.....DAMNIT!! LOL! I just learned that one of the broadcast spots I cut here at In Sync is being submitted for a Key Art Award! I don't want to reveal which one or for which movie at the moment because I don't want to jinx the process. If anything solid happens I'll definitely post the news! The Key Arts is the Oscars of motion picture advertising that encompasses trailers, broadcast spots and print ads such as 1-sheets and outdoor promotion. 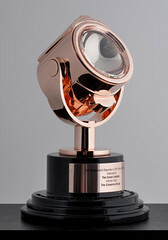 The Golden Trailer Awards, now in it's thirteenth year, is also held in very high regard with recognition of trailers and broadcast spots. Although the Key Arts has been a true staple of the industry for the past four decades. Documentary filmmaker Morgan Spurlock has created a wondrous love letter to our beloved Comic-Con with all the yearning, excitement, anticipation and passion that everyone who attends feels at one time or another! Following seven individuals during the 2010 event as they traverse the cavernous Exhibit Hall trying to break into the comic book industry, desperately hunting for that collectable figure they've waited months to possess and even proposing to their significant other before Kevin Smith and 6,000 other people in the gi-normous Hall H.
We get an intimate look at people whose direction at the event is also different from ours and a side of the convention we may have never realized. Connecting perfectly with what makes Comic-Con a 'mecca' for fanboys and fangirls, we ride along with these always familiar participants while Spurlock's cameras catch all the action...even though for the first time he never appears on screen to guide us. Certainly not a drawback, we do hear from the likes of Kevin Smith, Joss Whedon, Harry Knowles and the master himself, Stan Lee who provide kind of an above the convention overview of why this event has grown, expanded and practically pushed down the walls with it's love of all things comics, sci-fi, movies, TV, video games and the extremely popular and crazily creative cosplay. Today's cosplay has completely blown out the concept of donning a character costume or uniform and inhabiting that character to such lofty heights, it makes what we did back in the 80's look so incredibly amateurish by comparison. 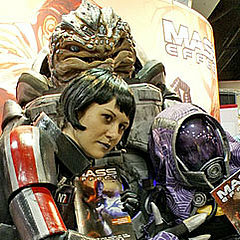 This is never more on display than when we follow an up and coming costume designer / performer who hopes to gain the attention of the film and gaming industry with her crew's incredible presentation of the main characters from the video game "Mass Effect 3" at the masquerade. My only note regarding the film would be that there are a few moments when, for those of us who've been there, you don't quite realize the true size of what's happening around the camera. It's certainly far from lost on the viewer, but I think just one or two wider shots to encompass everything inside and out might have helped....but these are only minor quibbles. Wisely shying away from obvious problems Comic-Con continues to develop regarding issues like the size of crowds waiting in hours-long lines and seriously over-priced hotels, Spurlock lets loose only the positive side of this annual event and certainly a side I prefer to concentrate on and appreciate most of all! Lovingly produced, directed and shot, if you attend regularly or even if you have it on your calendar to go at least once in your life, see this movie! Oh and BTW, we were there in Hall H during Kevin Smith's talk when the young fan we follow in the documentary proposes to his girlfriend in front of the masses! It was truly a very sweet moment to be there in person, appreciated just that much more by seeing the trials and tribulations he went through to make it happen. Even though we're very done with the whole 3D fad, there's one filmmaker I knew would completely step up to the plate when it not only came to this format, but in the normally less-than-perfect conversion process: James Cameron. "Titanic" would be the one exception in today's crop of films presented in converted 3 dimensions which, no matter whose had a hand in it, has only ever looked like glancing into a View Master. Always bringing the highest level of perfection to everything he creates, Cameron and his technical crew have done a a great job at enhancing what was already an incredibly beautiful, harrowing and extremely emotional film. I'd probably have to say the one thing that resonates more in this new outing for the classic movie is the sense of tension, peril and anticipation of doom as the great ship strikes the iceberg and begins it's lengthy death. This movie fast became one of my all time favorites so to go into how good it actually is would be redundant. Needless to say the 3D nicely enhances the emotion and spectacle within. This was the first time I'd seen it on the big screen since it's initial release and when I heard they were going to be presenting the movie in the Arclight Dome I was ecstatic! We HAD to go there! The movie sports only one visual change. Hayden Planetarium Director Neil deGrasse Tyson commented to Jim Cameron that the star field that appears above Kate Winslet's character as she looks up from the icy sea was incorrect. Once again, Cameron being the ultimate perfectionist, changed the star field shot for this 3D version to make even the heavens above that final stamp of accuracy on that cold April night. Now that's devotion! One of my absolute favorite sequences in the movie is right after Jack (Leonardo DiCaprio) yells "I'm the King of the World!" and a giant tracking shot lifts us up from the bow of the ship cutting through the waves, continuing over two of the boiler funnels, flying high above passengers on deck, settling down once again to the surface of the water as we see the sterm of the great ship moving away from us. This one shot, beautifully photographed and seamlessly married with top notch effects in 1997, is even more spectacular and resonant now in 3D. Definitely check out this enhanced re-release before it's limited engagement ends. While desperately awaiting news that a thrid "Tron" feature length movie is in the works, here is the first full-on trailer for "Tron: Uprising" which premieres this June. I am seriously onboard for this and very excited about Bruce Boxleitner voicing Tron himself!! Watch this wonderful behind the scenes documentary short about the restoration of "Jaws" for the Blu-ray release this coming August. This is in connection with Universal's 100th Annniversary and the goal of restoring 100 of their most classic films. I seriously appreciated not only the extreme attention to detail that this post production team is committed to, but also the level of incredible respect they have for the original version of the film. Even with a new 7.1 surround sound mix, they're retaining ALL of the sound effects from the 1975 film....just bringing everything closer and clearer than we've ever heard, or even seen in this landmark film, before. I'm certainly very picky about what I pick up on Blu-ray since I still stand my ground that I don't want to replace my entire collection from standard DVD. However, "Jaws" is a BIG exception and I fully intend to own a copy when it comes this summer! First leg of this summer's movie location trip: booked! I just purchased our plane tickets to Calgary, Alberta Canada and the first movie location we'll be arriving at: the Kent Farm from "Superman, The Movie". We also know which day we'll be heading to Rapid City and Devil's Tower (just two hours west) so that's about to be booked as well. As a side trip, we also plan to take in Mount Rushmore which is right there just south of Rapid City. This will give us at least two and a half days in Wyoming and South Dakota before heading on to the "Field of Dreams" ball field just west of Dubuque, Iowa. I've also managed to find two more filming locations from "STM" to check out while we're in Canada: where young Clark Kent runs alongside the speeding train, hopping over the tracks right in front of it....and Smallville HIgh School where Lana asks Clark to come by Mary Ellen's to listen to records. All within about an hour's drive of one another, Kent Farm included. Continuing to do research on the best hotels close by as well as transportation when we get there. Still trying to come up with a cool name for our adventure. Last night Rebecca and I discussed the possibilities, which went from funny to meaningful and connective to even something crazily innovative. Hey, this is too big a trip to just be called that; a trip. Some MAJOR projects have come my way at work and one of them I was extremely excited to be laboring on in December can now be revealed. They gave me a crack at working on a full trailer for Ridley Scott's "Prometheus" right before the holidays after I'd expressed heavy interest as another editor was working on one. I've learned here that you're not handed trailers right away unless you've had some prior experience with them. I, of course, have not cut a major theatrical trailer in my career yet so this was an opportunity for me to take some down time we were in the middle of and go to work...not to mention stepping up to the plate that I wanted to be a part of the bigger picture on this project. After getting some fantastic feedback about the cut from my boss, they ended up sending mine and the other editor's to the studio. I was informed that we could hear something back right away or it could be some weeks. When we did get some feedback I found out that Fox was very impressed with what we both came up with, but ultimately decided to go with another trailer house they had more of a relationship with recently. Such is the way in the industry. The new trailer that was released a week and a half ago is of course the one from the other house. Frankly, I think we did a much better job and took a much edgier approach. More in line with the way the film should be marketed. 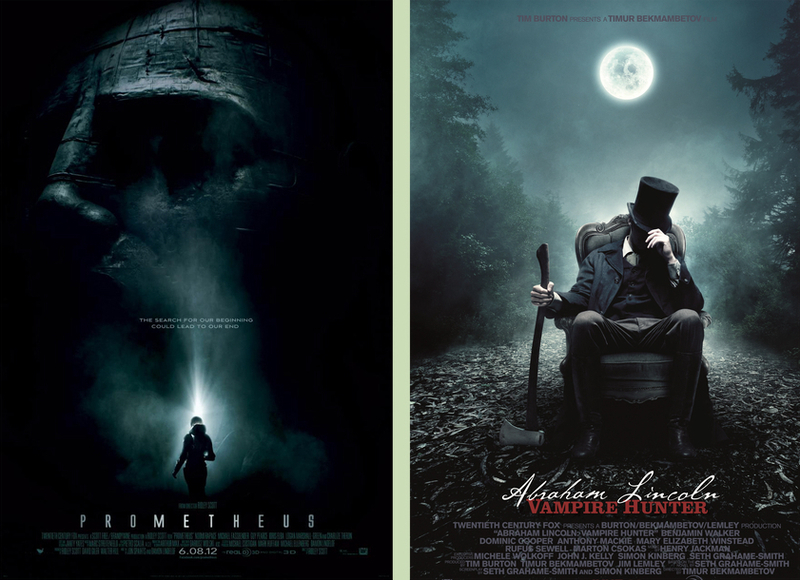 So moving past that yet staying on the same high profile track, I started working on broadcast spots for "Prometheus" as well as "Abraham Lincoln: Vampire Hunter", another much anticipated movie of the summer, over the past two weeks. These have been some pretty fun and wonderfully creative projects to be on! They're in front of studio eyes at the moment along with two broadcast spots for two other movies I can't talk about now. Four of my spots are awaiting approval so it could get REALLY busy at any moment!